The ideal DROP and GO system for busy people. All we need to do is complete the application form (either On-line or In-store), and Purchase a $10 Weatherproof Express Bag. 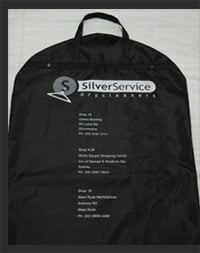 This service avoids all queues – simply drop your Silver Service Express Dry Cleaning Bag over the counter and let one of our staff know when you wish to collect it. We will process your order – apply any current discounts – pay for your order via your nominated credit card – then clean and press your garments ready for collection. You will receive an SMS or email when your order is ready for collection.